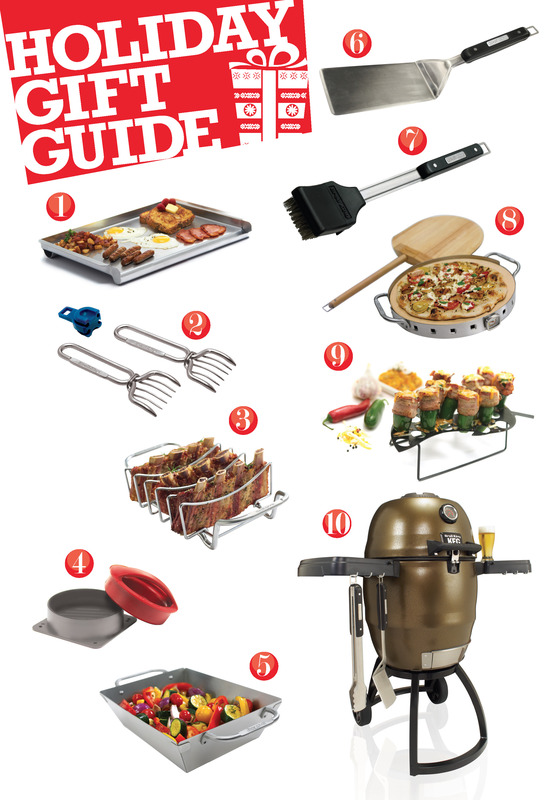 Broil King Barbecue Griddle – This is a great gift for a novice chef just getting into grilling. A griddle is a versatile and handy tool perfect for making breakfast, lunch or dinner. Broil King Stainless Steel Pork Claws – If the chef on your lists enjoys tending their grill for hours on end, consider a pair of the Broil King pork claws. Built to last and perform, these shredding claws are designed for both holding and pulling pork roasts, pot roasts and poultry. Broil King Rib Rack This tool will double or triple the number of ribs a grill-master can get on their grill or smoker. This rack also makes it easy to remove ribs and roasts from the grill. GrillPro Stuffed Burger Press This press is the best way to make gourmet stuffed and regular burger patties right at home. Grill enthusiasts will love experimenting with the endless menu options this tool provides, like Greek style burgers stuffed with feta cheese, roasted red peppers and olives, or Tex-Mex style burgers stuffed with jalapeño and cheddar. Broil King Deep Dish Wok Topper This deep, perforated, stainless steel wok allows flame to add flavor and texture to your favorite recipe. The wok topper is an essential addition to any griller’s accessory collection. Broil King Super Flipper For the busy chef that is entertaining a crowd this flipper is ideal. Chefs can flip more burgers at once with the extra-long blade, and keep the refreshments flowing with the integrated bottle opener. Broil King Stainless Steel Grill Brush This heavy duty grill brush features a ‘grime guard’ – it keeps the grill and the grill-master clean. Pair it with a biodegradable grill cleaner, and a set of replacement heads and let the chef focus on the cooking, not cleaning. GrillPro Jalapeno Pepper Rack – This unique item adds grill appeal to this popular appetizer. Broil King Grill Stone Set – This set lets backyard chefs prepare and serve authentic style pizza at home. Broil King Keg You’ll find this item on many Christmas wish lists this year. A great option for the gas grilling enthusiast looking to get into charcoal.